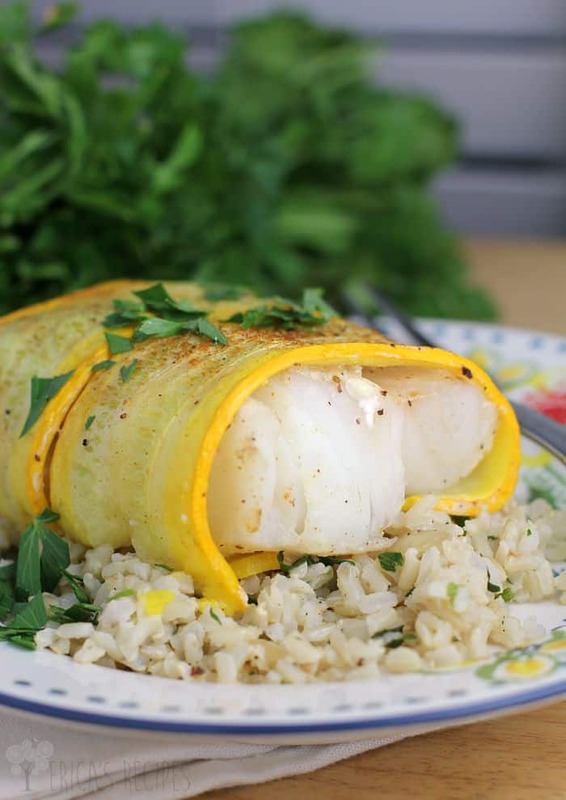 Light and healthy cod, wrapped in beautiful golden zucchini from the farmer’s market, served over fragrant and flavorful garlic and cilantro brown rice. 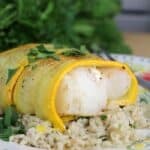 This perfect summer Zucchini Wrapped Cod dinner is easy enough for a weeknight and elegant enough for a special occasion. OK folks. It is time to talk triathlon again. Eight weeks. That is how long I have until my next race, the Hutchinson Island Half Iron. This will be my third triathlon at the half iron distance (1.2 mile swim, 56 mile bike, and 13.1 mile run) this year – or ever, actually – and I am really excited for this one. Not freaking out …I am actually excited! And that feeling feels awesome. For us, summer is drawing to a close. So strange to say that given the weather and that where I live is tropical …but school starts in a week. So there you go. Last fall-winter-spring overwhelmed me. By May, I was overstressed and just over everything. That is not me and I did not like who I was becoming because of it. This is my favorite place in the world …and I have told noone where it is. 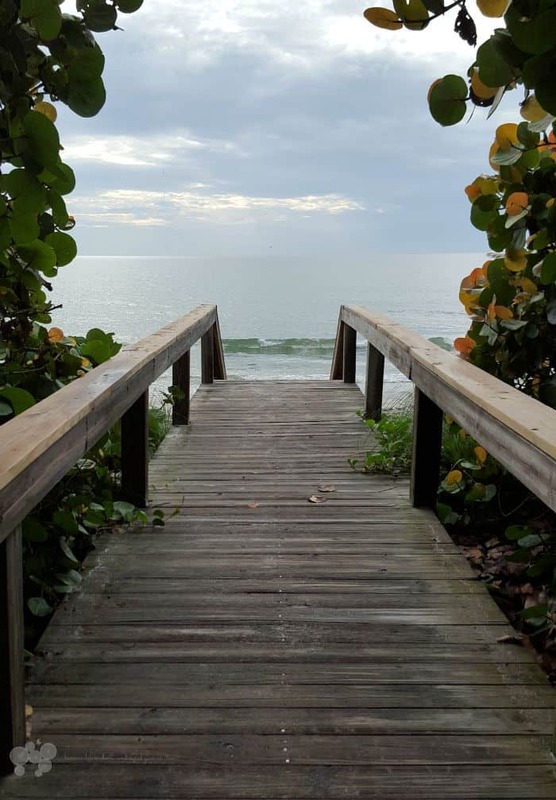 Once school ended – along with a number of extracurriculars – and the dust settled, I was able to make this my summer of zen. Walking the beach and yoga have worked wonders. I have never focused so hard on relaxing. …But another thing I did was actually keep up with training for my next race. And that, my friends, is a feeling that does wonders for me. Stopped on a bike ride to snap this bit of still Heaven. 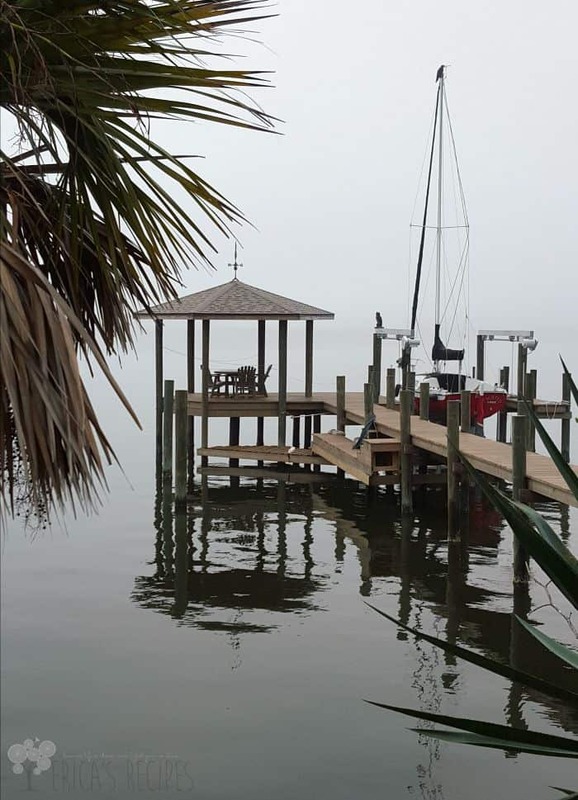 I love the red of the boat against the early morning grey of the intercoastal waterway. …even if most of it happens before the sun is even up. And of course, eating properly is so important to me. So it is from this happy place that this nutritious meal comes. Why wrap fish with zucchini? I have no answer other than I just thought it would be cool. …it was delicious. Light cod, my favorite white fish, just a smidge of light mayonnaise, and the zucchini, come together into an unexpectedly delicious combination. Then sit that atop fragrant, garlicky rice, and this meal is just divine. Golden zucchini are absolutely delicious, but if not available simply substitute regular zucchini. 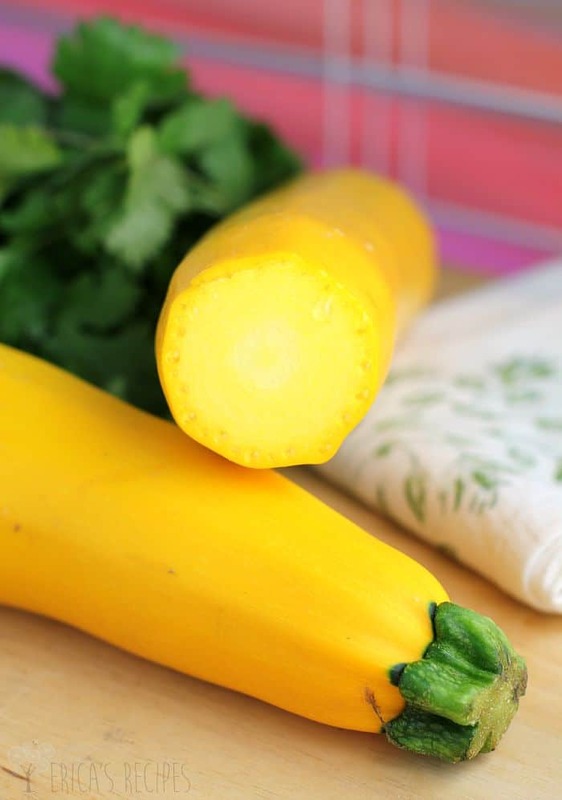 Golden yellow zucchini are a sweet farmer’s market find. I have used them before, such as in the Farmer’s Tart, and they are yummm. I have seen recipes where fish are wrapped in zucchini and cooked stove-top, but when I have tried there has always been one problem. …the zucchini slips right off when you go to turn the fish. There is no recovering from that. …So, in this recipe I solved this little problem by first browning one side of the zucchini slices to get that color and soften them a bit, thennnn wrap the fish and bake to delicious donesness. This tactic worked perfectly. Because I need carbohydrate to replace my glycogen stores depleted from exercise, I put this fish over brown rice. I wanted the rice to be awesome though – not just brown rice. So garlic. Because garlic. And cilantro because I love cilantro. Not everyone loves cilantro though, I get it. So if you are once of thooose people with that genetic what-not and cilantro tastes like soap to you, then just use parsley. Easy peazy. Now, for a recipe like this, you want your zucchini slices uberrrr thin. As Montey Python would say, wah-fer theen. Well, even using a mandolin, mine were not so thin. Which is another reason my recipe is so awesommmmeee. Because by cooking the zucchini just a skosh, it is softened so it can be wrapped easily around the fish. The problem is solved, and the recipe is now approachable for those of us in the general population. So, here it is kids. Healthy, quick, and easy. And stupendously tasty. This dinner symbolizes a lot for me and where I am right now – ocean, sun, health and well-being, and working out like a beast. 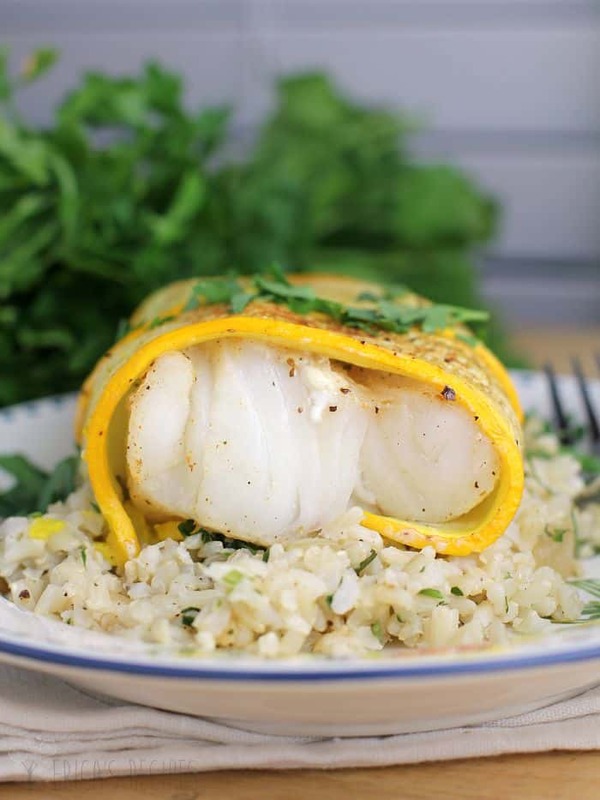 Light and healthy cod, wrapped in beautiful golden zucchini from the farmer's market, served over fragrant and flavorful garlic and cilantro brown rice. Cook the brown rice according to package directions. ...or, for a fool-proof method, see my directions for Perfect Brown Rice. While the rice is cooking, heat 2 teaspoons olive oil in a medium nonstick skillet on high heat. Add the onions and reduce heat to medium-high. 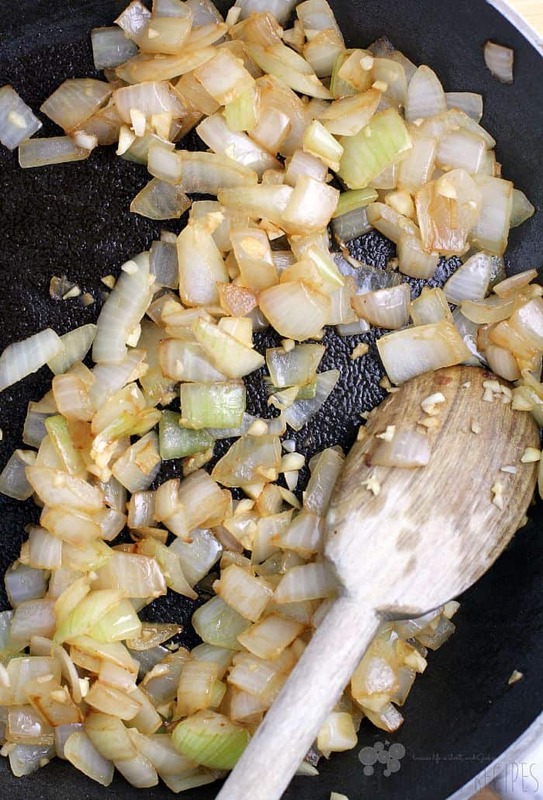 Saute the onions gently until they are lightly browned. Add the garlic and continue to cook, until the onions are well browned. Watch the heat, reducing if necessary, so the garlic does not burn. Add to the rice once the rice is finished. Heat the oven to 400F. Season the fish with salt and pepper. Schmere the fish lightly with the mayonnaise. Heat a large skillet on high heat with the remaining 2 teaspoons olive oil (I used a cast iron skillete). Working in batches, add the zucchini slices to brown one side only and soften. Remove zucchini and let sit until cool enough to handle. 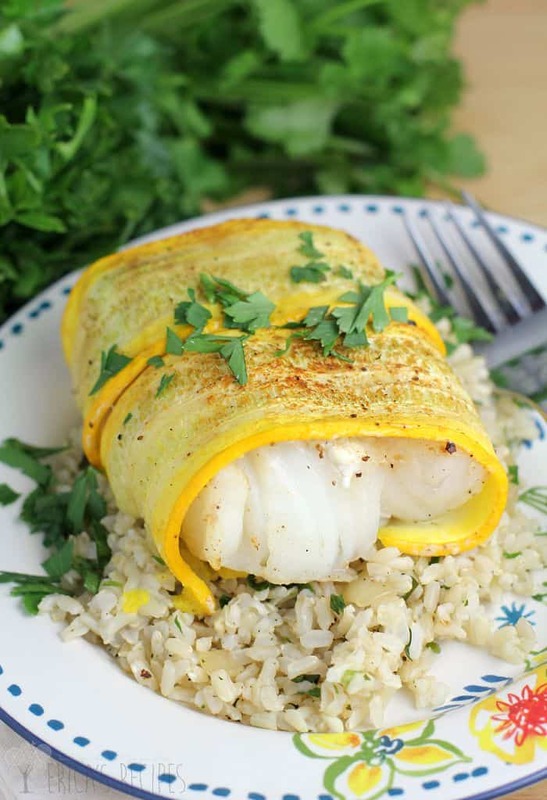 Wrap each piece of cod in zucchini, browned sides out from the fish. Dust the tops with Old Bay seasoning. Bake at 400F for 20 minutes, depending on the thickness of fish, until the cod flakes easily with a fork. 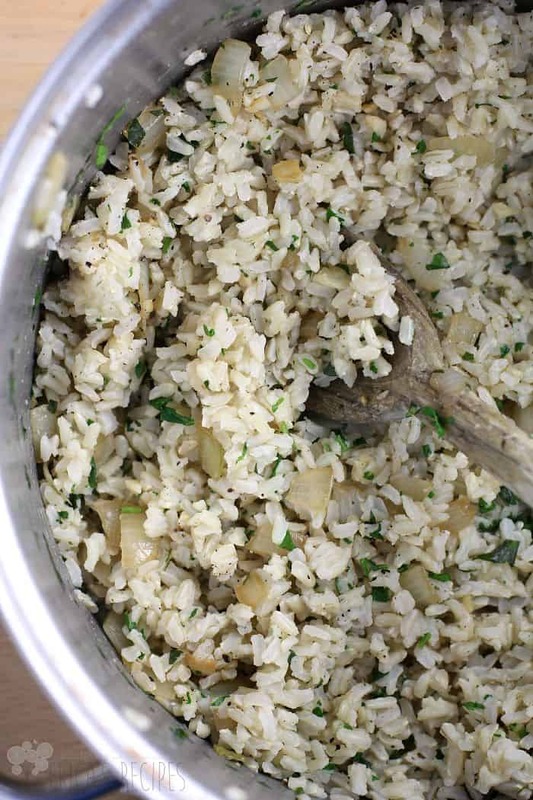 Serve immediately over the Garlic Cilantro Rice. Yield: 4 servings. My kind of dish. I think the yellow of the zucchini is a perfect way to make the dish so colorful. Good luck with your training. This look SO good Erica! The only starch I’ve been eating is brown rice a few times a week, and I only know how to cook it in the rice maker. This meal looks like a keeper! Thanks. 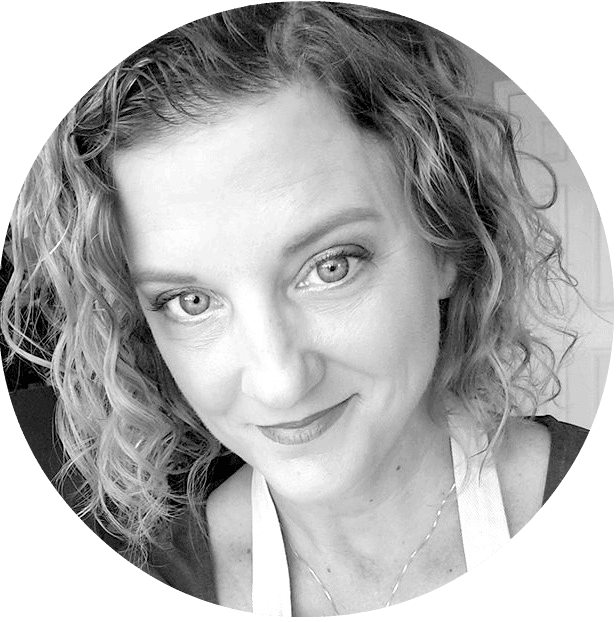 Erica, I love this recipe! I am so making it ASAP! We have been going low carb so I may serve it with something else, but Cod is Grumpy’s favorite fish and I am so excited to find a new way to make it for him! I imagine I could use our yellow summer squash for this! Love this and I adore cod. Great photographs and delightful post. What a fantastic way to cook fish! Cod is one of our favourite kinds of fish. I will need to try this for sure! This dinner loos great. The golden zucchini is beautiful. And, your post made me feel relaxed! Thanks! This looks like a new favorite! Love the flavors, so delicious! What a deliciously, healthy fish dish! Great flavors! Pinned and shared! What a beautiful dish Erica! Erica, I love everything about this dish – the golden zucchini, garlic cilantro ice, and the fact that you use cod!! (I haven’t eaten cod fish in the longest time). Thank you for sharing!! Pinning! This is a gorgeous dish and perfect for summer.